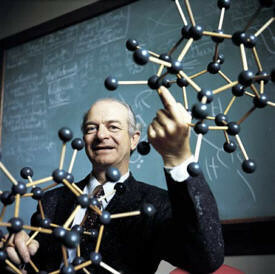 Linus Pauling was one of the greatest men who ever lived. He was a chemist, professor, best-selling author and both a peace and health activist. He was a pioneer in the fields of quantum chemistry and orthomolecular medicine and Francis Crick, the co-discoverer of DNA, called him "the father of molecular biology." He is among the most important scientists in any field in any century. He also developed a fascination for UFOs and the possibility of alien visitation. 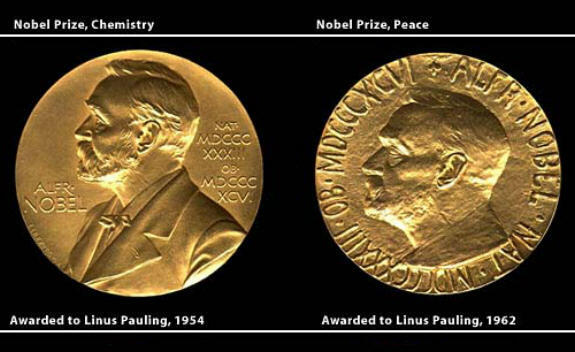 Pauling is one of only four people to have won more than one Nobel Prize and one of only two people to have been awarded a Nobel Prize in two different fields, Chemistry and Peace. The other was Marie Curie who won the Chemistry and Physics prizes. He's also the only person to have been awarded both of his prizes without sharing them with someone else. Pauling's UFO related books, notes and correspondence are held at the Oregon State University library's Special Collections department, a detailed account of the contents of the collection can be read here, and reveal both the two-time Nobel winner's curiosity and, in some cases, skepticism. Notes in the margins of books indicate that Pauling intended to follow up directly on some matters that caught his attention and that he highly doubted some claims made regarding others. 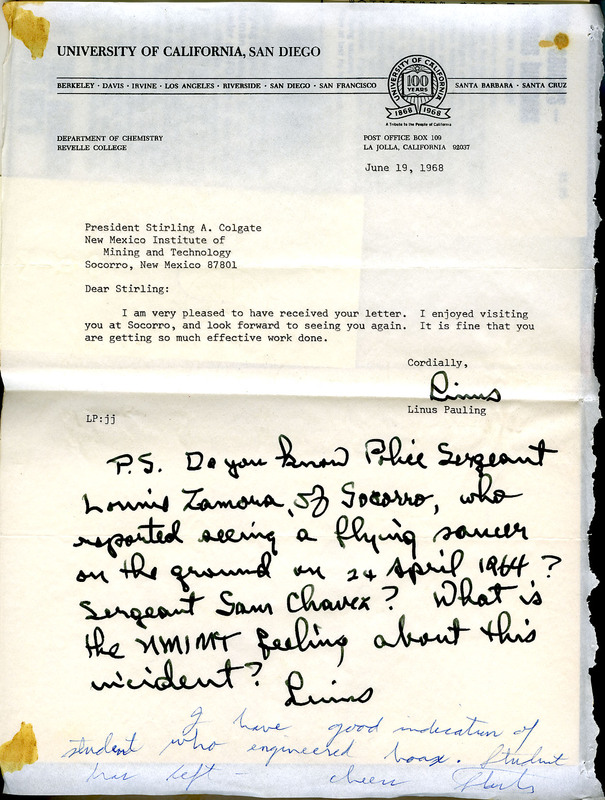 Correspondence with New Mexico Institute of Technology President Stirling Colgate demonstrates that Pauling did take action on his curiosities, asking Colgate what he knew of the 1964 Socorro UFO landing case. Pauling's letter and Colgate's response, which can be viewed here, was that it was a hoax, but the details of all that are another story for another blog. 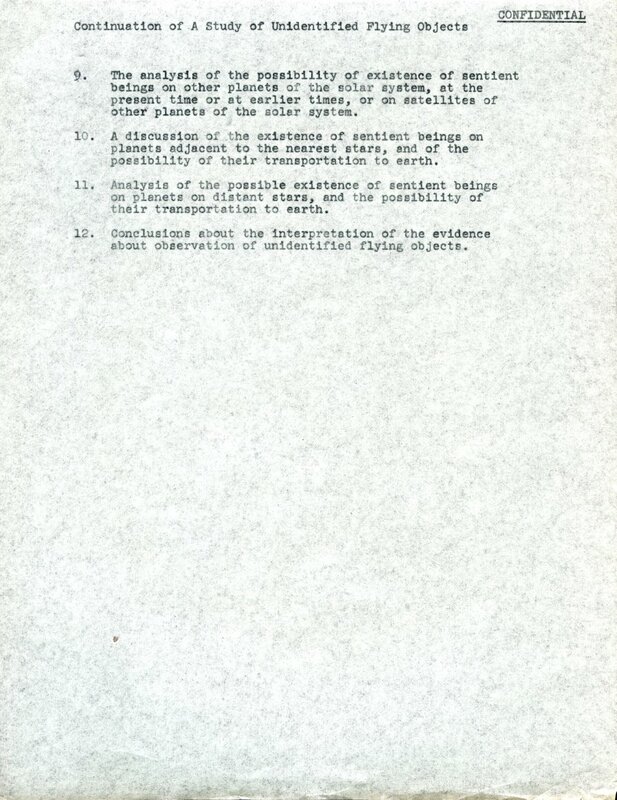 The most compelling document in the collection is Pauling's own outline for a proposed study of the UFO phenomenon. The two-page plan, written in July, 1966, can be viewed here and here. Clearly, this document is the work of a methodical and disciplined person. In Point One, he indicates that reports of the same phenomenon by different people in different locations merit special attention. 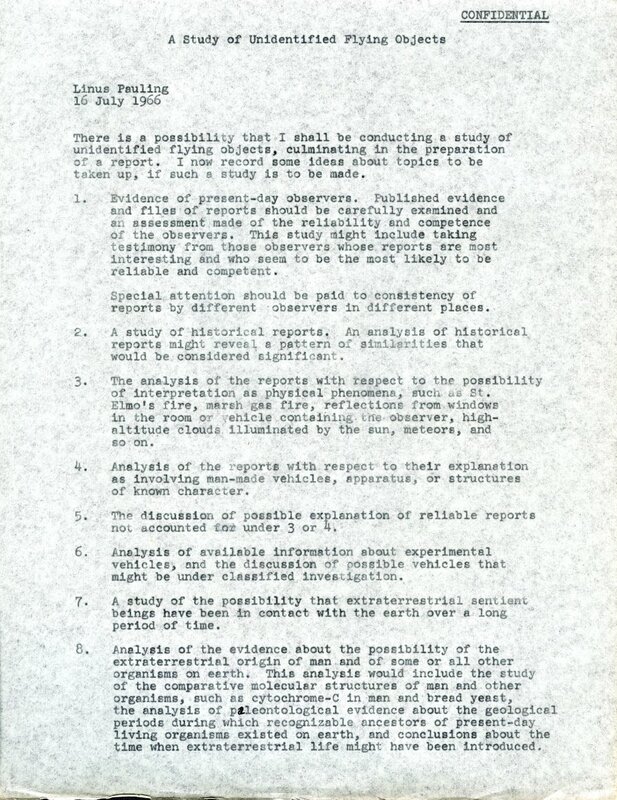 In Point Six, he recognizes that off the books experimental aircraft are likely responsible for some UFO sightings and that information regarding those vehicles will not be readily forthcoming from the government or military. In Points Seven and Eight, he even considers ancient alien visitation and alien seeding of the Earth in 1966! That's a few years before von Daniken's Chariots Of The Gods was published. Finally, in Points Ten and Eleven, he gets right to the heart of the matter which is, how might an advanced extraterrestrial civilization be able to build vehicles that can do what is, to us, the unthinkable: Actually be able to somehow control or transcend space and time itself and traverse the light years' distances between neighboring stars and our planet Earth. Who knows why he never followed through. It seems Pauling may very well have been asked to join the Condon Committee investigation as his outline for a UFO study seems to correspond with the timeline of the Condon effort. In this interview with Pauling he refers to Condon as "Ed" which indicates to me they had at least a passing friendly relationship and Condon helped Pauling write a petition calling for the banning of atmospheric nuclear weapons testing, so the collaboration was significant! You'll find it at the 17:00 mark. Whatever the reason, it's regrettable that he didn't, but looking at that agenda, it's pretty clear it wasn't because he suddenly determined UFOs were all a bunch of nonsense. He also certainly wasn't fearful of public ridicule as he had already put himself in harm's way with his staunch advocacy of peace in general and an end to nuclear weapons testing, which led to his Nobel Peace Prize, in particular. The backlash from his decades of peace activism included having his passport pulled by the U.S. State Department for two years starting in 1952, being called "the number one scientific name in virtually every major activity of the Communist peace offensive in this country," by the Senate Internal Security Subcommittee, and Life magazine termed his 1962 Peace Prize victory as a "A Weird Insult from Norway." I'm old enough to remember Pauling when he was still quite active publicly and was strongly advocating people take vitamin supplements, especially vitamin C. He lived until he was 93, so he was certainly on to something. The guy was obviously an active thinker what with that, his peace activism and chemistry work as well as his interest in UFOs. It's also obvious he maintained a sharp sense of humor, as this video evidences. I hear many people call for more scientific study for UFOs but the calls are vague. Pauling has left a clear game plan and his status in the world of science is analogous to the greatest of sports hall of famers. That simple document is something to rally around. I started taking 1.5 grams of Vitamin C awhile back and haven't gotten sick since. I highly recommend that folks at least take a closer look at what Dr. Pauling had to say. I began following his vitamin C regimen for stage 3 ovarian cancer 32 yrs ago. I started with 6 grams daily and quickly increased my daily dose to 40 grams - which is 40 of those huge pills or plenty of vitamin C powder mixed in my juice. Given the choice, I agreed to an extremely aggressive course of cisplatin chemo (no longer given in that strong a dose nowadays). I started the vitamin C 3 days after my first treatment. Within a couple of days, my gums stopped bleeding and the bruises on my legs disappeared. I continued to increase the dosage when I got those results. The cisplatin failed to entirely clear the cancer cells from my stomach. NCI looked at my case and recommended full torso maximum radiation as "this patient's only chance for long term remission". I had that radiation and continued to take the 40 grams of C. I had also been adhering to his megavitamin therapy, so I daily took a soup bowl of various vitamins, including the 40 C's. Radiation team at Stanford U were amazed that I was the only patient without any radiation skin burns or rash or irritation. I also had no colon complications, which are typical for this kind of radiation. I was 35 at the time. The docs had nothing left to give me so could not justify a surgical third look if they cut me open to check for cancer because they felt I would have so much internal radiation scar tissue, they'd be unable to put me back together (that's how they phrased it). I am now 67 yrs old. 7 yrs ago I was diagnosed with stage 4 kidney disease - damage caused by the cisplatin chemo. My veins were also damaged so dialysis was not an option. I received a kidney transplant 3 mos ago, against the advice of my former radiation oncologist (newly retired from Harvard) that any abdominal surgery was too dangerous due to the extensive scar tissue that the kidney surgeons would find in me. But, I had no choice. My transplant surgeon was prepared to make an incision all the way up my torso and cut through bands of scar tissue to make a pocket for the new kidney. But he decided to first at least try the standard pelvic area. To his surprise, when he cut into my pelvis , he found NO SCAR TISSUE! 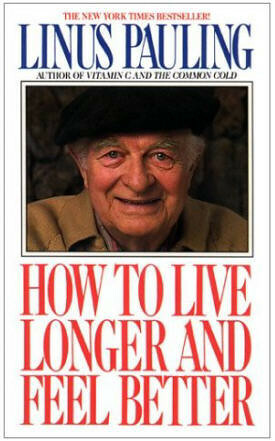 Linus Pauling saved my life TWICE. I have always held him in the highest regard. That he was not only a genius, but a peace activist, plus all his other many achievements, make him a true hero and far above and beyond his peers. That's great to hear! I did bump my C intake to 3 grams a day since 2010 and am now into my 4th year of being cold and flu free. Tell your friends . . . tell everybody. At least give what Dr. Pauling had to say a listen.